On Monday, December 2017, Vladimir Putin unexpectedly interrupted his journey to Egypt, stopping off at Russia’s Hmeymim airbase in Syria and announcing the windup of Russia’s most successful military campaign abroad which began in September 2015. Thousands of combat sorties have been flown, tens of thousands of terrorists and their infrastructure have been destroyed, and hundreds of Syrian cities and towns have been liberated. We have previously published accounts of how Russian pilots, special ops, marines, doctors, and diplomats spent two years helping the lawful president of Syria, Bashar al-Assad, hold his country together and rid it of terrorists. 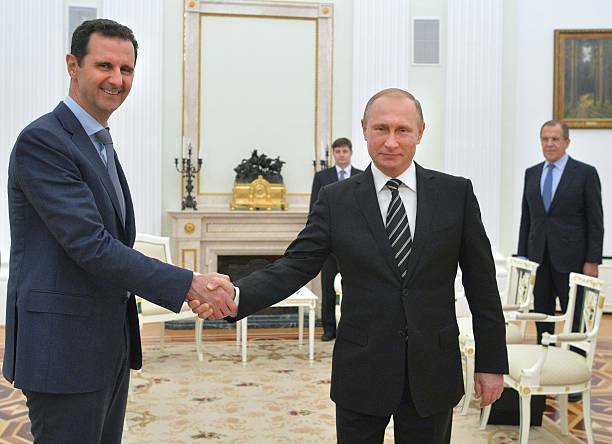 From the very beginning, Russia provided diplomatic support to Syria. Back in the spring of 2011, Vitaly Churkin, the late Permanent Representative of the Russian Federation to the UN, vetoed the draft Security Council resolutions being proposed by some Western and Arab countries that were anti-Syrian in nature. 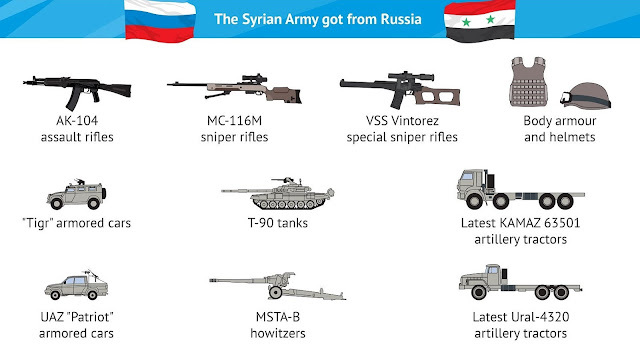 In addition, Russia backed the government of Bashar al-Assad by supplying arms, military equipment, and ammunition, in addition to training officers and providing military advisers. But as the terrorist organizations and forces of the “moderate opposition” continued to make territorial gains, it became clear that this support was not enough. The Syrian Arab Army was running out of steam. Huge losses, shortages of the most essential materials, plus low morale forced those soldiers loyal to Assad to cede more and more territory, retreating as far as the coastal province of Latakia and the city of Damascus. By September 2015, it looked like Syria’s leader had only a few weeks left in power. So in the month followed, Syrian President Bashar al-Assad request to Russia’s Federation Council was approved and Mr Putin made a decision to move Russian troops into Syria. On Sept. 30, a Russian military operation began in that country. Strikes were even launched against the terrorists’ base camps from inside the Russian Federation. The A-50 early warning and control aircraft, the Tu-214R, and the Il-20M1 radio reconnaissance plane coordinated air operations, carried out reconnaissance missions, and pinpointed targets for the strike formations. Russian aviation really ran the show in Syria. Militant training camps, command posts, weapons and ammunition depots, oil fields, and convoys of gasoline tankers found themselves decimated by massive attacks launched from the Hmeymim airbase, the staging bases for air strikes, and the Admiral Kuznetsov aircraft carrier. Bombers, close-support aircraft, and fighter planes taking advantage of their total mastery of the air managed to destroy more than 100,000 different terrorist facilities. The first wave of the massive air strikes against IS came at the end of 2015. That was when Russian planes pulverized a buried IS command post, underground bunkers, and warehouses in the province of Hama. During their high-profile mission to “seek and destroy” gasoline tankers, Su-34 fighter-bombers managed to sniff out approximately 500 tanker trucks carrying petroleum products, plus dozens of oil refineries, grinding them into the sand. That was a punch to the gut of the IS war chest, as its main source of income was the illegal sale of black gold. In late 2015, the Syrian desert was rattled by the most powerful blow yet – strategic Tu-160 bombers, Tu-95MSs, and long-range Tu-22M3s dropped more than three dozen missiles and a multitude of bombs, destroying the command posts of IS detachments in the Idlib and Aleppo provinces, as well as training camps for suicide bombers. In the summer of 2016, long-range Tu-22M3 bombers took off from Hamadan Airbase in Iran and blew out their bomb bays over militant targets in Aleppo, Deir ez-Zor, and Idlib. Regular air sorties supported the Syrian operation from beginning to end. 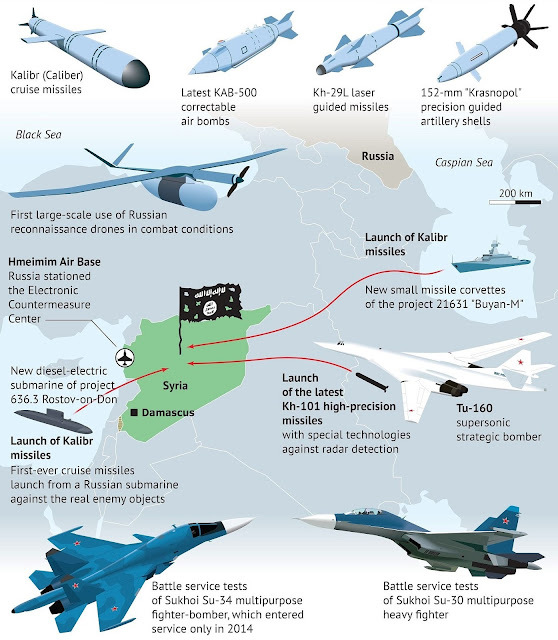 In addition to aircraft, Russia also put its combat ships, submarines, and coastal missile systems to effective use in Syria. Some types of weapons got their first test under battle conditions. In November 2016, to be exact, the Russian military employed its Bastion coastal-defence missile systems to spectacularly obliterate a large warehouse belonging to the militants with the help of its Onyx anti-ship missiles. 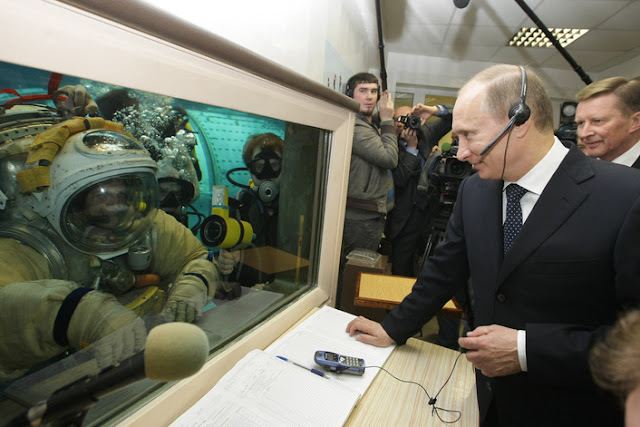 In October 2015, the Russian Navy was responsible for a widely reported cruise-missile attack from the Caspian Sea that annihilated militant positions with an unprecedented show of strength. The Dagestan, a missile-armed frigate, and the Grad Sviyazhsk and Veliky Ustyug small missile patrol ships released an enormous swarm of Kalibr cruise missiles that flew over several countries to blow up more than a dozen targets in a militant-controlled territory. In June 2017, the Russian Navy’s Admiral Essen and Admiral Grigorovich frigates, as well as its Krasnodar submarine, used Kalibr cruise missiles to inflict a powerful blow from the Mediterranean Sea against terrorist command posts and ammunition depots in Hama province. The capture of Aleppo marked the final turning point for the government forces in Syria, after which it was possible to withdraw about half of the air formations from the Hmeymim airbase in May 2017 and send them home. Russian aircraft were able to administer continuous, nonstop strikes against targets belonging to terrorist groups in Syria. From the onset of the military operation until September 2017, over 30,000 sorties were flown and about 92,000 attacks on terrorists were carried out. Russian planes bashed terrorists with the active support of the most elite force in the Russian military, the soldiers from the Special Operations Forces, who conducted reconnaissance missions, corrected the moves of aircraft and artillery, trained Syrian soldiers and officers, conducted raids deep into enemy territory, set up countless ambushes along the routes of terrorist convoys, and neutralized the leaders of outlaw gangs. The ships and aeroplanes of the Syrian Express had an important role to play, supplying weapons, armoured vehicles, and ammunition to the embattled country. Russian doctors were responsible for true acts of heroism, treating the civilians and servicemen who had suffered injuries in the war. And a huge role in the resolution of the Syrian crisis was played by the Russian diplomats who set in motion the negotiations in Astana. Those made it possible to establish the de-escalation zones in Syria that are still operating effectively today. 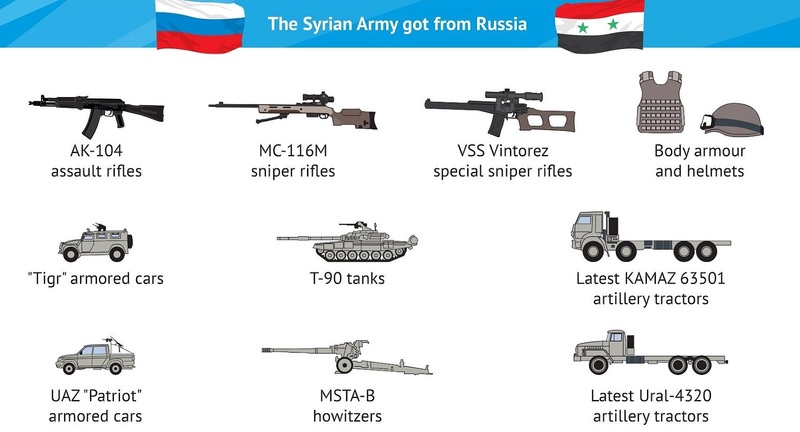 But of course it was the Syrian people who won the real victory – the Russian military just helped to remind them that the enemy can be defeated even if it enjoys the unconditional support of the West. A new article in Military Review, the official journal of the US Army Combined Arms Center (USACAC) military educational institution, has concluded that Russia has won "at least a partial victory" in Syria, and done so "with impressive efficiency, flexibility, and coordination between military and political action." The article, published in the journal's March-April issue, is titled "What Kind of Victory for Russia in Syria?" and outlines why the Russian-led coalition in Syria, in the authors' estimation, is "closing in on its own military and political objectives." In a frank appraisal of Moscow's concerns ahead of its intervention, including the threat of Islamist militants taking over Syria and then moving on to threaten Russia in the Caucasus, the authors explain that a "successful intervention" would offer Moscow "victory on three fronts: preventing US-backed regime change in Syria, breaking out of political isolation and forcing Washington to deal with Russia as an equal, and demonstrating at home that Russia is a great power on the main stage of international politics." Praising Russia's "lean," "flexible," "small footprint" approach, the journal pointed out that Russia successfully dealt with issues including lack of experience in combat operations abroad since the Soviet withdrawal from Afghanistan in 1989, Russia's rather limited long-range supply and support capabilities (compared to those of the US, presumably), and the complexity of coordinating with its Syrian, Iranian, militia and other allies in a crowded battlefield environment. 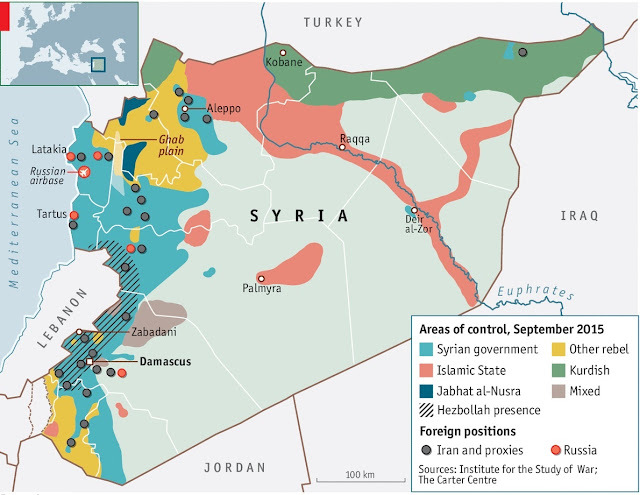 The authors admit that the Russian military fairly and quickly overcomes the difficult strategic situation facing Damascus, while "working under severe resource constraints" and having to "change the calculus and policy" of countries including the US, Turkey, and Saudi Arabia, convincing or coercing the latter into changing their approach. This included pushing Washington into tacit acceptance of the Russian intervention, as well as Syrian President Bashar Assad's "de facto victory over the radicals as well as the defeat of US-backed opposition." In this regard, the article noted that although Russia's success" was not unqualified, "it appears that if the campaign in Syria is not a victory for Russia, it is certainly a defeat for those who opposed the Russian-led coalition." The journal stressed that notwithstanding early doubts about Russia's prospects, "especially given recent Western experiences in expeditionary operations in the Middle East," Moscow generally prevailed.